Whether cyber security, governance, risk and compliance or cyber risk resilience – the growing challenges can only be met with a holistic cyber security strategy. The modular structure of the services offered by InfoGuard equally takes into account technologies, processes and your employees. Our long-standing experience in the field of security consulting, audits and awareness, together with the top-class expertise of our specialists ensure the smooth interaction of all elements. ICT security, risk management and compliance are different sides of the same coin. Without watertight ICT security, reliable risk management is impossible, nor can compliance be assured. Nowadays, the big challenge for companies lies in the growing number of technical and organisational aspects they must take into account in order to abide by legal requirements, deal with risks and ensure information security in their routine business. This requires a great many intricate skills in the individual technology and management disciplines. Equally critical, however, are expertise in and experience of the interfaces and the interplay between the various areas. Access to first-class process and technology specialists from all areas. 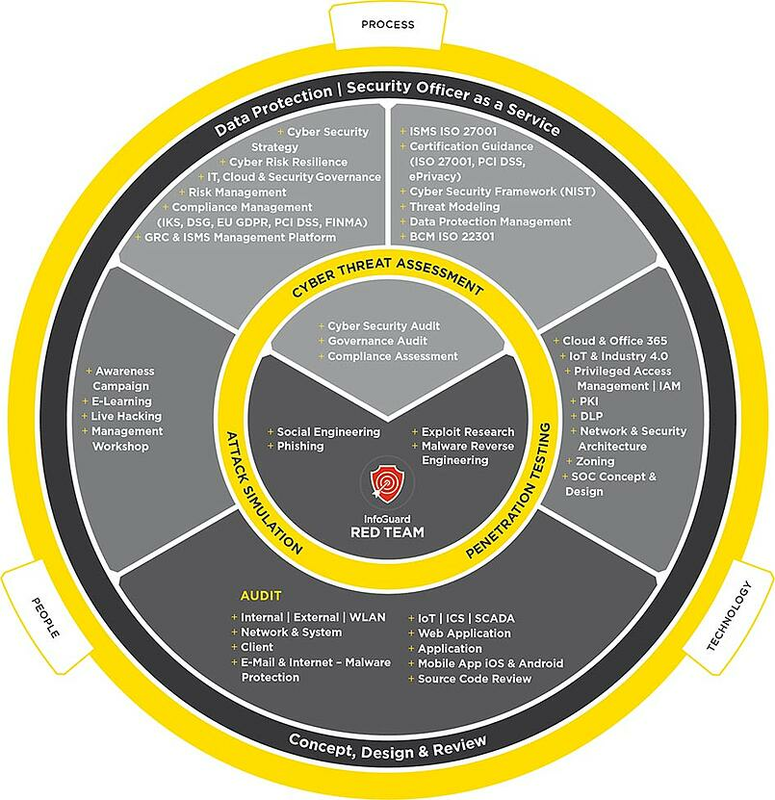 All the elements of security, compliance and risk management processes from a single source. Modular services tailored precisely to your specific needs. Cross-industry best practices from numerous implementation projects. Adherence to all recognised international standards. Extensive experience of compliance requirements. ICT security, compliance and risk management are our core competence. Regardless of whether you lack internal resources in certain departments, are looking for strategic support or need additional expertise to develop a framework or a management system: our specialists are well-versed in all the elements and processes and have extensive cross-industry experience from all kinds of different sectors. Our modular range of services can be adapted precisely to your individual requirements. We have a detailed knowledge of the specific requirements of the Swiss economy. Strategy and architecture are the bedrock of optimum security and the efficient implementation of statutory requirements and guidelines. Developing them requires a broad and deep understanding of all the processes and technologies involved. Drawing on the expertise of our specialists, you can expand your organisation's competencies and increase the efficiency of your ICT security in very specific ways. Compliance and risk management are subject to ever more stringent requirements. Even the best organised ITC departments can find themselves stretched to the limit implementing a constant stream of new guidelines while also keeping on top of their day-to-day business. Our specialists have detailed knowledge of the relevant regulations and know from very broad experience how they can be efficiently implemented. With our support, you can rest assured that your compliance and risk management are always under control - leaving you free to focus on driving forward digitalisation at your company. Attackers are constantly changing their tactics. Your own ICT infrastructure is changing just as fast. The latest threats and weak spots are the bread-and-butter of our security specialists. InfoGuard undertakes targeted security audits to verify your security processes, the IT infrastructure and employees. This then serves as the ideal basis for increasing your information security for the long term and helps identify, assess and eradicate risks early on. Download our whitepapers, templates, promotion flyers, informative brochures about our services and much more - all for free in the InfoGuard Download Center!